It has been called the most famous work of sculpture in the world. And it came from Milos, this most southwesterly of the Cycladic Islands. A farmer named Yorgos Kentrotas discovered it on April 8th, 1820, in a covered cavity in the ruins of the ancient town of Milos, which is near the modern village of Tripiti. A French naval officer named Olivier Voutier, who was exploring Milos at the time, was led to the spot by Kentrotas, and a couple hours after he began digging, he uncovered the statue, in 2 sections, divided into lower and upper halves, along with a left hand holding an apple and pieces of the left arm. Otherwise, the statue, which became known as the Venus de Milo after its installation in the Louvre, was armless. Even with her damaged nose, Venus de Milo is considered one of the finest-executed statues to come out of the Hellenistic period, which was the approximately 300-years between the death of Alexander in 323 BC and the emergence of the Roman Empire after the battle of Actium in 31 BC. You'll have to go to Paris to see the statue, but a visit to the island it came from makes for a bigger, richer, more interesting experience. Milos is one of several islands of the Cyclades that is off the beaten track, and gives you perhaps a more pure Greek island experience. 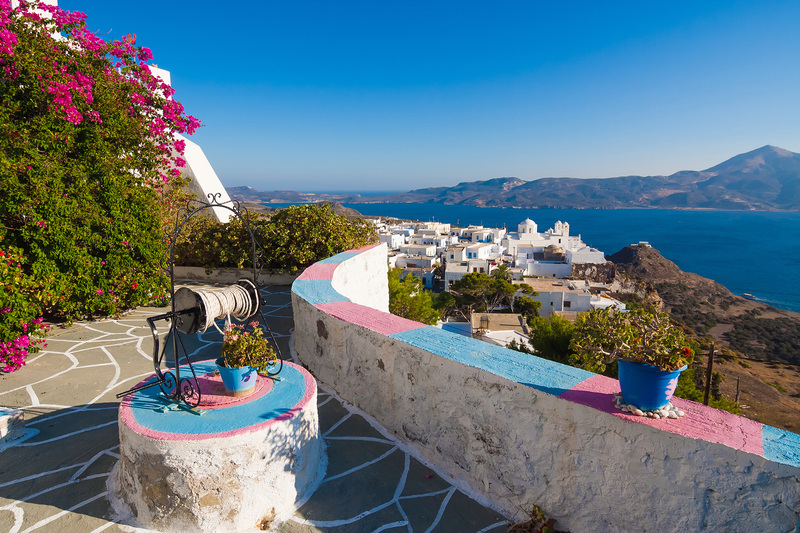 Milos, like Santorini, is an island full of fascinating, convoluted rock formations of many colors thanks to its history of volcanic activity. It is an island of multi-colored rocks, of spectacular sunsets, of thermal springs, of secluded beaches, and of simple people who treat you with courtesy. Milos's location, almost exactly half-way between Athens and Crete, gave it geographical significance. It also boasted mineral wealth, particularly in obsidian, an igneous, volcanic glass which fractures "conchoidially," that is, in a curved, concentric pattern that produces very sharp edges. Obsidian cooled too quickly at the leading edge of a lava flow for its molecules to form crystals, hence the glass. Obsidian was a favorite material for making cutting tools-knives, scrapers, spear points, arrowheads- in the ancient world. Obsidian had such great value that it was sometimes transported a thousand miles from its point of origin. Obsidian from Milos was a trade commodity as long as 15,000 years ago. There is scarcely a single farming settlement in that part of the world that did not use obsidian. Being a gemstone, obsidian, which can come in a variety of colors other than the predominant black, was also fashioned into jewelry. Its shiny, reflective surface also led to its use as mirrors, and artisans have worked obsidian into figurines, small sculptures, and masks. As the Mediterranean world shifted from the Stone to the Bronze Age (around 3,000 BC in the Aegean), the value of obsidian in weapon-making declined. Tuna fishermen built the settlement of Phylakopi on the island's northeast coast around 3,000 BC. In the late 1800's the Minoan-era town wall was uncovered by archeologists, as well as a building that has since been named the Pillar Room, which has a famous wall fresco of an extremely well-executed image of a flying fish on it. Phylakopi was a major population center for 19 centuries, until the 12th century, BC. There were a lot of artifacts, mostly pottery, uncovered there, the oldest of which date from the early Cycladic period (3200-2000 BC), and then, later, pottery of Minoan origin, which led to the supposition that Milos was a colony of Minoan Crete's. Crete was at least a major trading partner. Trade with Crete declined precipitously after the Minoan Eruption on Santorini around 1600 BC, after which Mycenaean Greece became more involved in the affairs of Milos. It was at Phylakopi, and nowhere else in the Cyclades, that a Megaron, a rectangular building serving as a great hall, and a feature of Mycenaean palace complexes, was built. Again, this is either evidence of a Mycenaean takeover of Milos, or evidence of the islanders adopting a construction style from a major trading power. A shrine was found at the site of the Megaron in the 1970's, as well as the famous "Lady of Phylakopi," a clay, colorfully-painted figurine dating from around 1100 BC. Phylakopi was abandoned around this time. Much of the ancient coastal town lies under the sea. Milos was then occupied by the Dorians, from Lakonia (Sparta), the Peloponnese. In 416, Thucydides tells of the invasion of Milos by Athens after Milos refused to cooperate with Athens in her war against Sparta (431-404 BC). Although the islanders' roots were Spartan, they preferred neutrality in the conflict. During a lull in the war, Athens landed a force on Milos and demanded allegiance as part of the Delian league, the Athens-led alliance of city-states and islands which had morphed from a defensive scheme against the Persians to a vehicle for empire for Athens. When the Melians refused, Athens invaded, sacked the main city, executed all the men who had not escaped, and sold the women and children into slavery. After Athens lost the Peloponnesian War the Spartan general Lysander re-took the island, kicked out the Athenian colonists, and returned the previous residents to their homes. "With reason did the Athenians adjudge Diagoras guilty of atheism, in that he not only divulged the Orphic doctrine, and published the mysteries of Eleusis and of the Cabiri, and chopped up the wooden statue of Hercules to boil his turnips, but openly declared that there was no God at all." The following centuries saw a succession of powers occupying Milos. During the early Christian era, Melians began to bury their dead in the Catacombs of Milos, considered one of the 3 most important of 74 such catacombs that have been discovered worldwide. With burials beginning in the 1st century, these catacombs may be even older than the better-known ones in Rome. In the Middle Ages Milos was part of the Frankish Duchy of Naxos. In 1566 the Ottoman Turks took over. Finally, in 1830, Milos became part of newly liberated Greece after she gained her independence from Ottoman Turkey. Mining continues to be a large factor in the economy of Milos to this day. In fact, it probably is one reason why tourism hasn't taken off as it otherwise might have. There is a theory floating around that the mine owners of Milos don't want the Melians to get soft pursuing the relatively easy life of renting rooms and running restaurants, because then they won't want to work in the mines. Author Ian Pilmer, in his Milos Geological History, says, "No matter where you live on Earth, each time you cook, eat, drink, wash, write, paint or travel, there is a very high probability that you will be using materials from Milos. Milos has been providing these basic commodities for civilization for thousands of years and it will continue to be a major world supplier of bentonite, kaolinite, perlite and pozzolan - rare materials from the Earth which we all use every day in our lives. If Milos does not provide such materials, then geology tells us that there are no other places in our Solar system that can." The geology of Milos is absolutely fascinating. The island lies on the South Aegean volcanic arc, and serves as a sort of seismic lightening rod to the deeper interior of the planet. Fumaroles- holes in the earth from which gasses escape- can be found on the eastern and southeastern sides of the island, which raises the soil temperature, and can give off the smell of sulfur. In places such as Agia Kyriaki, Paleochori, Kanava, and Rivari, gas bubbles to the surface in standing water. There are many thermal springs that have remain undeveloped. These are found close to sea level in Adamantas, Alykes, Kanava, Paleochori, Mandakia, Provatas, and Tria Pigadia. There are many convoluted rock formations, some stark white, like snow sculptures, others of mixed colors. The contrast of these colorful formations along the seaside with the solid blue of the Aegean makes for unforgettable images. Milos is shaped rather like a flattened horseshoe, with the large bay of Milos intruding deeply into the island's land mass at its center point. It's the most sheltered bay and natural harbor in the Aegean. On the northeast shore of this bay is the port city of Adamantas, where ferries from Piraeus and from other Cycladic islands drop their anchors. To sail into the bay and make for Adamantas is almost as memorable as sailing into Santorini's caldera. Just past the bay's entrance, on the left, is the village of Klima, noted for the row of boathouses along the shore, their wide sea-level doors water painted in blindingly intense shades of lime-green, orange, magenta, and navy blue, with equally brightly painted doors and balconies of the second story living quarters, all these colors offset and framed by the bright white of the buildings themselves, which, rectangular in shape, resemble a row of colorful dominos with common walls. 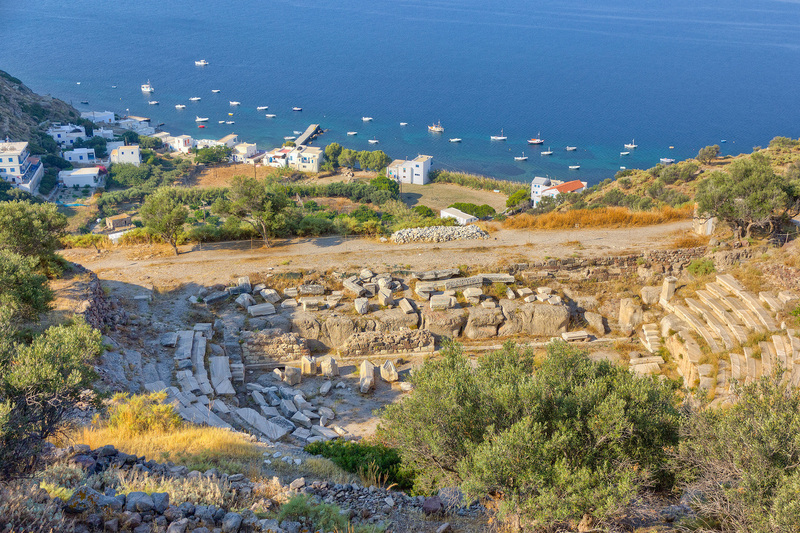 Just a few hundred meters inland from Klima you can find the catacombs, the village of Trypiti where the Venus de Milo was found, and several archeological items of interest, including a marble amphitheatre with a magnificent view of the island and the Aegean. About 500m northwest of Trypiti, in Plaka, is the archeological museum of Milos, with its exact copy of Venus de Milo sent as a gift to Milos from France. Adamantas is a small port town of about 1,500 residents (the island only has a year-round population of 5,000). It has a pleasant seaside promenade, filled with restaurants and cafes, and notable mining and maritime museums. 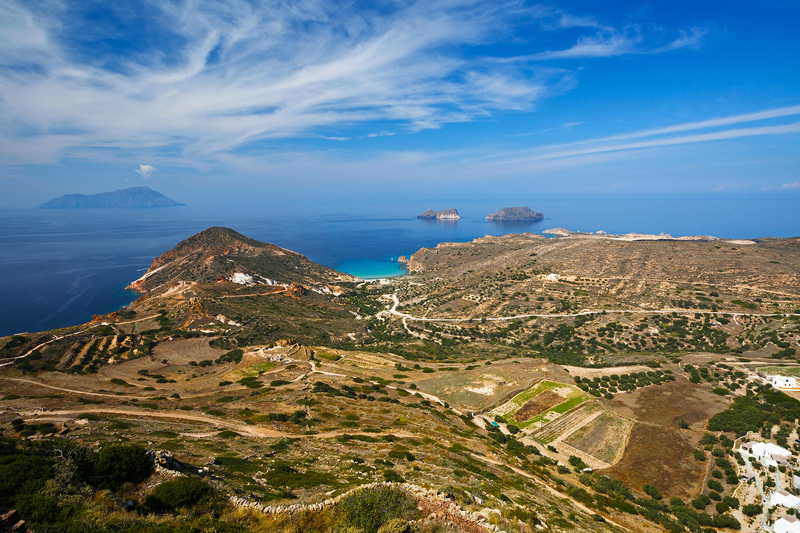 Milos is home to about 70 beaches, thanks to its highly convoluted coastline. They can be found all around the circumference of the island. What is fascinating about all of the beaches listed below, and just about all of the others, is that they are topographically defined by the island's busy volcanic history. They all feature dramatic rock formations and landscapes of different colors. All of these beaches are a snorkeler's paradise, with all kinds of marine life using the cavities and little crevasses in the rock under the water for shelter. Keep in mind that these beaches are nowhere near as well organized as are many others in the better-visited Cyclades, but that's part of their charm. Some are a little tricky to get to, meaning you may have to walk a few minutes, or climb over some strange lava flows, but they are all worth it. Let's start with Achivadolimni (Clam Lagoon) at the southern end of Milos bay, 4km due south of Adamantas across the water. This is a windsurfers' beach, with regular high winds that partakers of that sport love. On the other hand there are enough calm days of offer that a nice campground with good facilities has been built there. The Lagoon is a small saltwater body about 100m inland from the main beach. The best-known and most spectacular beach on Milos is Sarakinoko, just a couple kilometers north-northeast of Adamantas. As a matter of fact, much of which is worth seeing and doing on Milos- the Catacombs, the ancient ruins of Phylakopi, the archeological museum, the ancient amphitheater, the villages of Klima and Adamantas- can be found all within just a few kilometers from each other on this peninsula forming the right side of the " horseshoe." One of the most photographed places in the Aegean, the landscape of Sarakinoko is so moon-like that locals often refer to it as "Luna." Sarakinoko is a narrow inlet with a small beach at one end. Because it can be a bit difficult to get to, it's almost never crowded. It is a beach with little sand, and with little vegetation. Instead it offers you a fantastic landscape of volcanic rock as white as a bone sculpted by wind and water into some of the most phantasmagorical shapes on the planet. The smooth rock rising into sculpted cones with blunt peaks, mini-mesas, plateaus, and canyons looks like something from a location shoot for a Star Wars movie. The water forms an inlet, and people lounge around on the smooth rock, or grab a place on the semi-sandy beach where they can at least plant an umbrella. 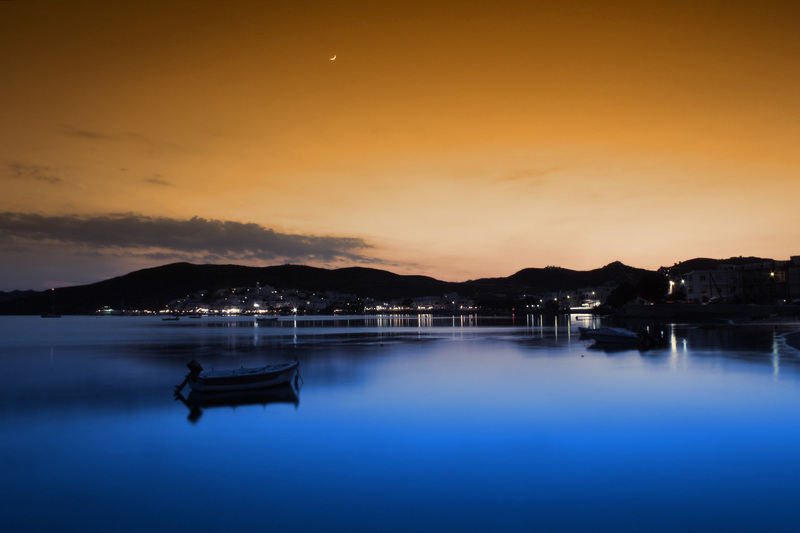 The contrast of white and the blue of the Aegean makes you think of the primary colors of the Greek flag. Along the coast the water has intruded into soft pockets of the rock, creating little caves. It's a bit of a hike to get to, but well worth it. A unique experience in this place is to see it by the light of the full moon, when the reflective quality of the rock comes out in the pale moonlight. Sarakinoko is also a great place for snorkelers. At about 18 x 10km, Milos is a small enough island that every one of its more than 70 beaches are fairly close to wherever you are staying. Just west of Sarakinoko and due north of Adamantas 3km is Mandrakia, which offers "off the rock" swimming and some really interesting boat houses, some of which have been built around caves which provide ready-made moorage. \their openings look like square tunnels framed in white, and the closed doors are painted bright blue. Heading clockwise along the north coast of Milos from Mandrakia and Sarakinoko, after about 6km you come to another beach with a similar, and actually more interesting configuration, to Sarakinoko, Papafrangas. This is a very narrow channel cut through the sheer volcanic rock which rises several meters above you. At the furthest point inland is a tiny beach just a few meters wide where you can plant your umbrella. What's interesting about Papafrangas in that, as you swim down the channel toward the sea, the rock arches overhead and forms a canopy for the last 25 meters or so. There is a second, parallel (and uncovered) channel, a bit wider and not as long, just to the south of the first one. Again, it's one of the most unusual places in the Aegean to go swimming. Along the sea there are several interesting caves. Heading along the circumference of Milos clockwise, Paleochori, on the island's southeast coast, is about 15 minutes (driving) from Adamantas. Paleochori is 500m of multi-colored pebbles, with some sand mixed in. To the east of a spill of rock looking something like an ancient lava flow extending into the Aegean, are another 300m of beach. The waters of Paleochori are a bit warmer than some other beaches on Milos because of little sulphur springs standing on the seabed like a field of mini-volcanoes, belching sulphur bubbles into the water which give off their characteristic smell when they break the surface. About 6kmWest of Paleochori, spaced about 500m apart, are 3 beaches at the center point of Milos's south coast: Tsigrado, Fyriplaka, and Provatas. Tsigrado is a small beach about 50m long, surrounded by 40m-high volcanic cliffs. It's the most challenging beach to get to on Milos, requiring a steep descent down the cliff face, a journey that includes scaling 2 wooden ladders and a guide rope. The beach is nice, though, and small caves pockmark its inlet. These 3 beaches, by the way, are products of the lava flow of Tsigrado volcano, whose slopes rise inland for about 500m to what used to be the volcano's cone, which has been truncated because of the intense mining of perlite. Greece is one of the biggest suppliers of perlite in the world, by the way. Perlite is what those little white specks you see in potting soil are. They're ultra light, and look like Styrofoam, but are actually air-filled bits of stone. The Tsigrado was last active some 90,000 years ago, making it the most recent active volcano on the island. At about 600 meters, Fyriplaka is a long beach just west of Tsigrado. It features a beach bar, sun beds and umbrella. The sandy beach is backed up by brooding cliffs and is decorated by several interesting boulder-like formations. Provatas, just west of Fyriplaka, has golden, soft sand and plenty places to eat, drink and snack. Gerontas (Old Man) beach, getting toward the southwest end of Milos, is another one with slightly difficult access, requiring a 10-minute walk after parking to reach. This unorganized beach's most interesting feature is its great stone arch, and some sea caves. 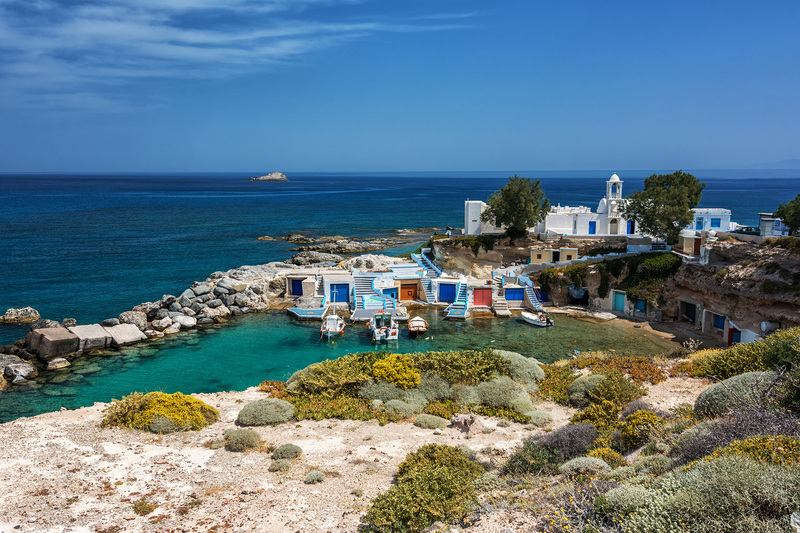 Just west of Gerontas, close to the southwest tip of the island, is Kleftiko, one of the most memorable places on Milos. This place was a hideout for brigands- Klephtes. Kleftiko, which is accessible by boat only, is characterized by towers of white stone standing in the water, hidden caves and coves providing hideouts for outlaws, and absolutely stunning, blue water. Those are just a few of the dozens of beaches on Milos. Milos, because of its position on the South Aegean Volcanic Arc, and the way it was formed, is the most geologically interesting and complex island in the Aegean. It's a place that is largely untouched my mass tourism, and a place you can spend a long time exploring and enjoying in relative peace and quiet.